Kenroy Home provided me with a free light fixture. We've now lived in our Nashville home for nearly 11 months. I got everything in order at lightening pace. For the most part, I've been pretty happy with all of my quick decisions, but not so much my office/workspace. After, you know, actually working in the space, it quickly revealed its shortcomings -- chief among them was that there wasn't enough storage for what is apparently an ever-expanding craft supply stockpile. Yeah, like for a war...a craft war. You can check out the office back in November here, and last month, I shared some changes that I made to help me work more comfortably. In addition to those changes, I made myself some new curtains, upgraded my light fixture, and treated myself to a serious pegboard situation to help alleviate my storage woes. Read on for more pics and details. What you'll find conspicuously missing from old photos of the room is an overhead light. That was for a reason. If you're super curious, you can see the old fixture in the next to last pic in this post. I could never find shades that quite fit these old fixtures, so I was dealing with a couple of bare bulbs, which obviously wasn't cutting it. Ultimately, I installed the Aden pendant from Kenroy Home. It has been the perfect addition -- a touch of femininity, a little shimmer, and a slight golden tone that nicely offsets the rest of the gold going on in the room. As for the curtains, I had gone with white back in November, because I'd thought that a bold pattern would compete and ultimately clash with the wallpaper. After a while, though, the white curtains on the white wall just weren't doing it for me. So I made myself a pair using this bold Dwell Studio fabric, and I think the geometric print works quite nicely with the more organic print of the wallpaper. And now, my pegboard. My precious, precious pegboard. I've always been a sucker for a pegboard, and this one has given me nearly endless options for storing tools, supplies, and even pics and decor. What's more exciting than versatile storage? Ammaright?! And in case you're wondering, half of those plants on the pegboard are indeed fake...but the window sill ones are real! Disclosure: Kenroy Home provided me with a free light fixture. All opinions are my own. Cute. I'm thinking about vertical storage options for my soon to be craft room. so lovely space!!! I want me too!!! I LOVE this!! 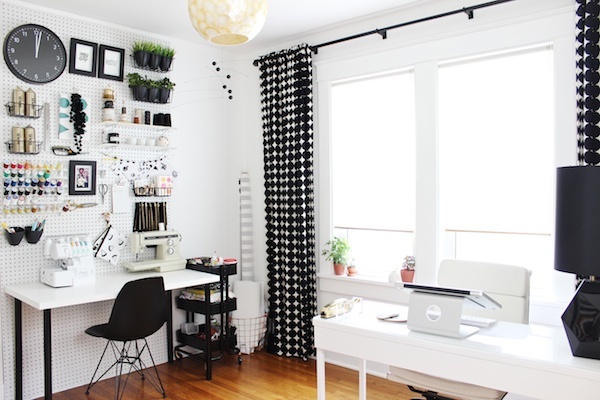 Found you on Pinterest...I'm always trying to think of ways to make my sewing area more clean and modern. This is gorgeous! I have printed this out - what inspiration! 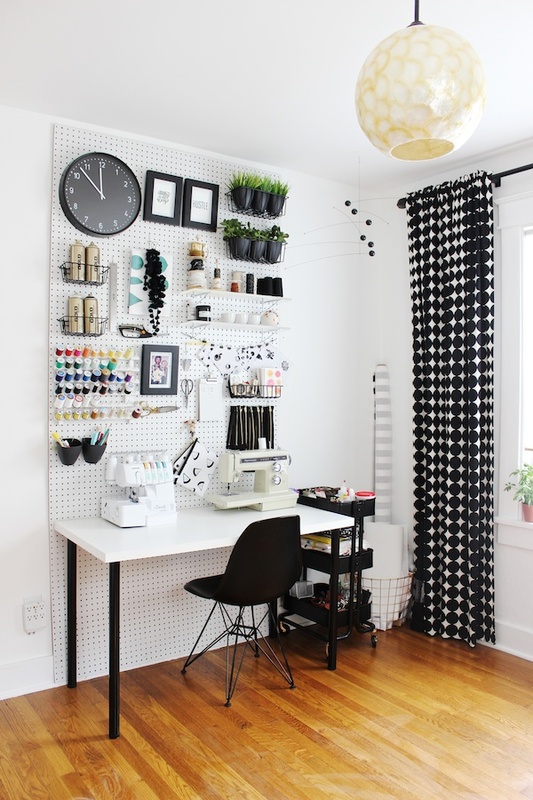 My sewing room is in dire need of an upgrade like this one. Is the spool holder made for the pegboard? If so, where did you get it? It's just the wooden kind they sell at Michael's and Joann. I spray painted it white, and hung it on a couple of pegboard hooks. Where did you get those metal baskets hung on the pegboard? Hi, Missy: I bought them from the Home Depot. They were available in the section with all of the pegboard accessories. Actually, Missy, these are the exact baskets that I purchased. Hope this helps! 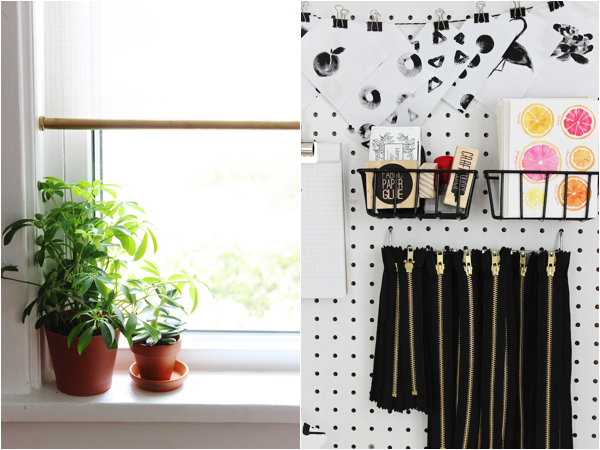 Mandy this is a beautiful and lovely space <3 Where did you bought the pegboard??? Thanks so much, Mariela! I got it from the Home Depot, but I'm sure most hardware stores carry it. This is such a lovely space. So inspiring. I'm definitely stealing some ideas for my workspace. Love everything about this! Thanks for sharing! It's my main inspiration for my own personal craft space in progress. Can you share what type of hooks are best used to hang the clock and frames? Thanks! Thank you so much! What a great compliment! I bought this variety pack, and used the smaller curved hooks to hang them. Hope this helps! Thanks so much! Sorry for the delay in responding! Here are links to each: laptop platform, chair, desk. Hope this helps. 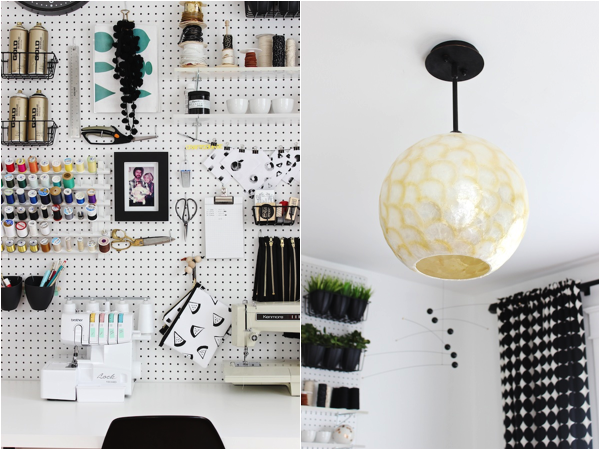 Love your office/craft space! 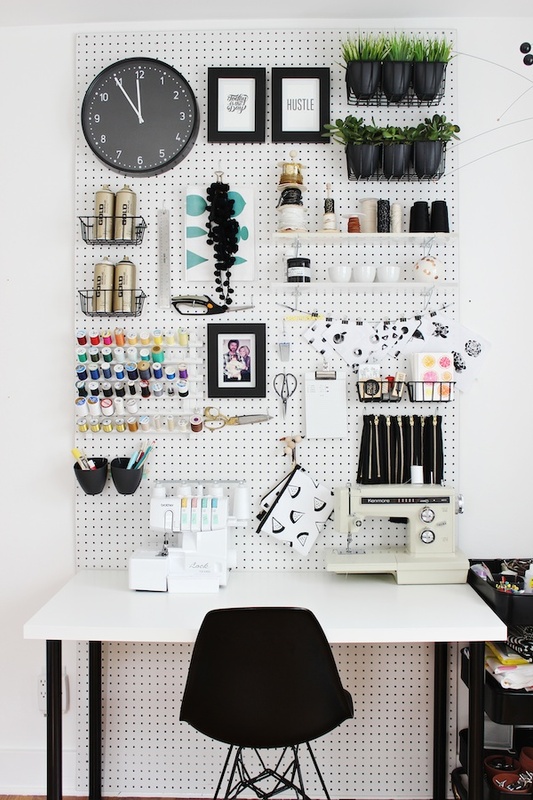 And I love the pegboard idea! I must know where you got the shelving pieces??? Thanks! I think I answered your question via email but for the benefit of others...I used custom cut acrylic shelves that I bought years earlier, but you could easily get the lumber department to cut you something to size from a 1x6 board. Hey! this is awesome. But how did you install the pegboard? Thanks! I installed the pegboard with about 10 long screws distributed throughout (along the edges and few in the middle) with a washer or spacer on them to give a little room between the wall and the board (to allow for inserting/removing hooks). Hope this helps! Beautiful space! So many clever ideas- thanks so much for sharing!